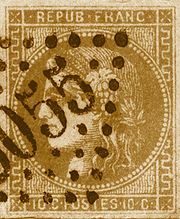 The famous 'Ceres' issue on the first January 1849 marked the necessity for postal reforms similar to these in the Great Britain (May 1840), and encouraged payment by the sender through the use of postage stamps. 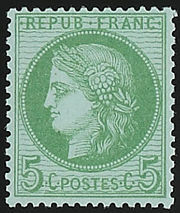 Stamp from the Bordeaux issue (Franco-Prussian War 1870-1871). 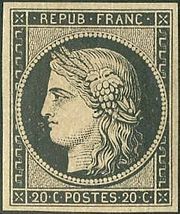 The two first postal stamps issued in France were of the Ceres series, a design was drawn by Jacques-Jean Barre, general engraver at the Paris Mint. In January 1849, the two first denominations were a 20 centimes black stamp and a 1 franc red. Postal reform was extended to other rates (local, rural and newspapers) and new denominations were issued. After a coup in December 1851, president Louis-Napoléon Bonaparte, then entitled Prince-President, decided to have his effigy on the stamps, issued progressively from September 1852 and throughout the Second Empire. During the Franco-Prussian War, after Republicans abolished the Empire of Napoléon III on 4 September 1870, they faced the siege of Paris by the German armies and the lack of stamps from the former rule. New Ceres stamps were printed until the insurrection of the Paris Commune, in Spring 1871. However, the printer claimed afterwards that he hid the Ceres series material and was forced by the insurgents to print Napoleon III stamps. After the war, the 'Ceres head' concept was kept until 1875. Printed only in Paris, new denominated stamps were printed by using old material. In July 1875, the postal administration gave the printing of its postage stamps to the Banque de France. The stamp design was changed too after the 'Commerce and Peace' series was introduced, following a competition. The new stamps were issued in 1876.